Your boat takes a lot of abuse both on and off the water — the corrosive effects of salt and water, the heat of the sun, the wear and tear of wind, and myriad jolts, bumps, and occasional collisions are all part and parcel of your boat’s life. There will always be some damages that you cannot avoid, but there are some measures that you can take to protect your boat (and your bank account). One very important measure that you should take is to cover your boat when it is in storage or not in use. Covering your boat will shield it from the worst effects due to sun, wind, and water. Some covers are meant to cover only part of your boat and are useful for when the boat is temporarily not in use, while most others are for purposes of winter storage. As with many other aspects of boating, covering your boat presents a variety of options and your choice should depend upon the features of your particular boat and how you will be using the cover. Below is a guide to the different types of covers available, along with their best uses. If your boat has an exposed console or another vulnerable feature, you should use a smaller cover even when the boat is still in the water. There are a variety of small or partial covers that can be put over a boat, and they include console covers, dodgers, and bimini covers (covers that provide a shade but allow wind to move under them). They are easy to use and are zipped or buttoned around the part of the boat for which they are built. If you are unsure of what to cover, look for exposed electronics, brightwork, and other delicate or intricate pieces. When you need to cover your boat for long period of time, such as during the winter, the cover should protect the entirety of the vessel. There are two basic forms: custom covers and universal covers. Custom covers are made specifically for your boat, while universal ones are made for more general models. You can also find semi-custom covers, which are made to fit all of a certain boat type. Universal and semi-custom covers are fairly inexpensive, and will work just fine for boats with standard features. Make sure to measure your boat from bow to stern, across the beam, and from the waterline to its highest point. 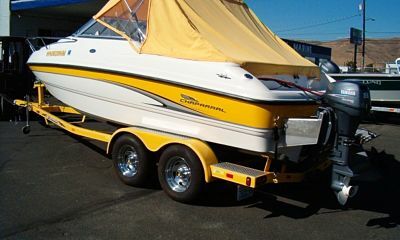 If, however, your boat has custom or unusual features, you will want to invest in a custom cover. Covers work only if they fit properly, so the extra expense for a custom cover is worthwhile if your boat is not standard. You do not want your expensive modifications to be ruined because you did not cover the cost of a well-fitting cover. Another consideration when selecting a cover is the type of fabric. This depends on the environment in which your boat will be stored, as well as whether or not you will be transporting your boat from place to place on the road. For example, if your boat is stored in a humid area, you need a breathable fabric like acrylic to prevent the growth of mold and mildew. If you are storing your boat outside, you need a highly water-resistant fabric like coated polyester to shield the boat from rain and snow. The other important factor is travel. If you are taking your boat out on the highway, your cover absolutely must fit snugly over the boat and be reinforced in areas of high weather impact. In addition, though color seems like an aesthetic choice, keep in mind that darker colors will increase a fabric’s UV resistance and makes it last longer. Unlike boat covers, which must be exactly sized to fit your boat, shrink wrap requires much less precision. Shrink-wrapping is the process of placing wide strips of plastic over your boat and heating it with a heat gun so that it fits tightly to every inch. This approach is precise and very efficient, and protects your boat very well. The possible disadvantages are that the shrink wrap cannot be removed during the winter if you want to get into the boat, unless you have built in an entrance, and it cannot be reused like a cover or a tarp. Once you take the shrink wrap off in the spring, it is just waste and has to be properly disposed of. In addition, since setting it up requires specialized equipment like a heat gun, you will have to hire a professional to wrap your boat. The same point about colors can apply to shrink wrap, in that darker colors (usually blue) will warm up faster in the sun and therefore melt snow better than white or clear shrink wrap. Another option for winter storage is to use a tarp. Though the material is much less durable, it is much cheaper, and this means that it can be useful for when you are storing your boat inside a garage or in a relatively sheltered outdoor area. The key to covering your boat with a tarp is to make sure that it is tied down securely. Tarps come with grommets around the edges, so you can cover your boat with the tarp and then run lines through the grommets and under the hull for maximum security. Be warned that they can tear easily, so avoid using them in environments which will expose them to bad weather conditions. No matter what kind of cover you use, make sure that you take care of it so that it can take care of your boat. Brush off any dust, clean off snow, and check to make that it is secure throughout its storage period. When the winter is over, you can take off the cover and find your boat as clean and intact as when you put it into storage.